What's the number one rule of business? Know your customer. Girl Scout and future titan of industry Danielle Lei, 13, officially has that one in the bag. 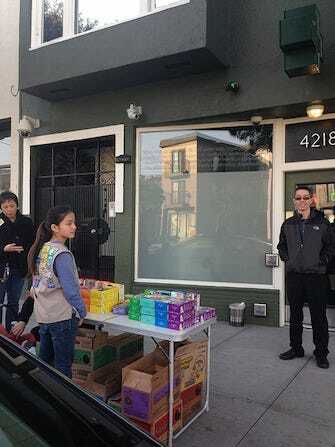 On Presidents Day, the teen (and her mother) decided to set up shop just outside The Green Cross medical marijuana dispensary in San Francisco. Shockingly, the cookies went like gangbusters. Customers gobbled up 117 boxes in just two hours, including her entire stock of Dulce de Leches and Tagalongs. Unfortunately, Danielle's business acumen has not gone down well with some (killjoy) adult humans. Some Girl Scouts of America officials, including the spokesperson for Girl Scouts of Colorado (where weed was recently legalized), have already expressed their disapproval. Danielle's mother Carol, for her part, said she and her daughters had set up shop in front of pot clinics in the past. She also indicated that she was using this particular opportunity to have a frank conversation with Danielle about drugs. As she told Mashable, "You put it in terms that they may understand," Carol said. "I'm not condoning it, I'm not saying go out in the streets and take marijuana[...] It also adds a little bit of cool factor. I can be a cool parent for a little bit."